Protecting everything that's important to you is now easier than ever with the wealth of smart home security cameras now on the market, and here we're going to put two of the very best up against each other: the Arlo 2 Pro and the Nest Cam IQ Outdoor. Which offers best value for money? Which has the best software running in the background? Which one can be relied upon to keep working even in a torrential downpour? All these questions and more are answered in the categories covered below. 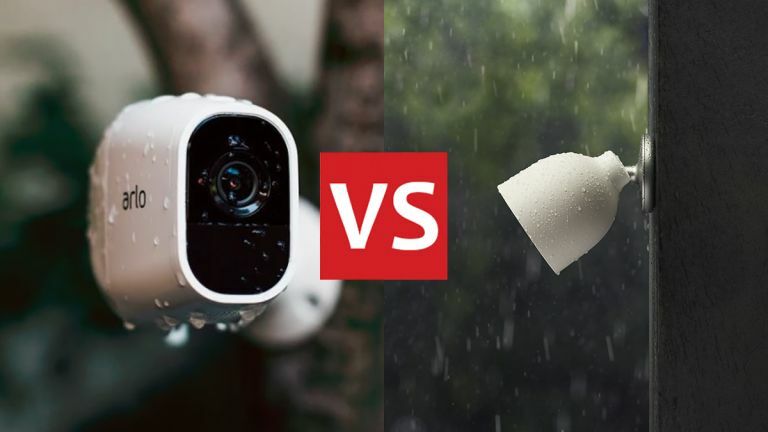 It's worth mentioning that both these cams are part of a wider range of devices from Nest and Arlo – if the Arlo Pro 2 or Nest Cam IQ Outdoor don't meet your needs exactly, there are alternatives even in the same series, which we'll discuss briefly below. The chunky Arlo Pro 2 looks as durable as it actually is, with IP65-rated weather protection to withstand rain, sun, warmth or cold. It can work plugged into the mains or running off batteries, and that gives you a lot of flexibility when it comes to positioning. Unlike the Nest cam, the Arlo Pro 2 requires a separate hub to be attached to your router – that hub can then manage as many Arlo cameras as you want to add, but it is another device (and another cost) to bear in mind. Otherwise setup and app operation is very straightforward. For our money the Nest Cam IQ Outdoor offers slightly better aesthetics – it's certainly more compact than its Arlo rival. It has a slightly superior IP66-rated casing too, so should be able to handle everything the elements can throw at it. The Nest cam can only run off a mains connection though, which might make installation trickier. Once you get into the Nest app, the camera is a breeze to operate and use (and to connect to your other Nest gear). It's a question of whether you prefer a camera that can work off batteries from anywhere around the home (Arlo) or a camera that connects straight to your router, no hub required (Nest). Both these security cameras offer a very similar set of features, though some are reserved for users who sign up for a monthly subscription (of which more below). You can tune into the live video feed from anywhere using your phone, and you get alerts when the cameras spot motion in front of the lens or hear unexpected sounds. Both the Arlo Pro 2 and the Nest Cam IQ Outdoor can record video in 1080p resolution, though the Nest cam has a 4K sensor (which apparently means better zooming and greater accuracy). We can testify that both cameras produce footage that's of very good quality – and both can see in the dark. Both cameras have two-way audio if you want to strike up a conversation with a potential burglar, but only the Arlo Pro 2 has a built-in siren, up to 100 decibels. If you want to scare someone off using the Nest Cam IQ Outdoor you're going to have to just shout very loudly instead. Neither camera comes with a security light that can flood your back garden with illumination, but the Nest Cam IQ Outdoor does have a light ring – basically a low-light ring that draws attention to itself. It might deter people from raiding your property but it won't light up your driveway or anything like that. It starts to get complicated when it comes to what you can do besides look at the video feed in real time. For free, the Nest Cam IQ Outdoor lets you go back through a whole 24 hours of footage, whereas the Arlo Pro 2 keeps a week's worth of footage – but only the snippets of video linked to motion or audio alerts. Chip in for a monthly sub (from £4/$5 with Nest and from £6.49/$2.99 with Netgear) and you get extras. Nest will give you more days of video history, the ability to set specific zones to monitor, and more intelligent alerts that can recognise faces; with Arlo, you also get more cloud storage, activity zone settings, and support for more cameras. We've also mentioned other cameras in the range: the original Arlo Pro and Arlo are still on sale, with lower-resolution footage and fewer features, as well as the Arlo Go – which can connect to cellular networks and run from battery power, so you could have it all the way down at the bottom of your garden. Nest has the Nest Cam IQ Indoor, for all your indoor security camera needs, as well as a variety of older versions if you want to save some money and don't want the very highest resolution footage or the smartest features. It might be worth taking a moment to see what else the Arlo and Nest ranges have to offer. As you can see from the deals widgets on this page, you'll pay more to get started with Arlo, because you need to buy the hub and several cameras at once – though once you work it out, the cost is usually cheaper per camera. There's not a huge difference in price: these two cameras are right up at the premium end of the market. Whether you go for the Arlo Pro 2 or the Nest Cam IQ Outdoor, you're going to be able to keep a close eye on what's happening at home wherever you happen to be. Both cameras can ping your phone with smart alerts whenever there might be a problem. If you want something that's battery-powered and doesn't need a mains power connection, then the Arlo Pro 2 is the obvious choice. Balanced against that is the fact you need a hub to go with it – if you just want a single camera you can set up with the minimum of fuss, maybe the Nest Cam IQ Outdoor is a better option for you. Really though neither of these cameras will let you down, from the quality of the hardware to the intuitive interface inside the apps. Bear in mind the other home smart gear you've got or might want to buy, too – if you're got your eye on a Nest Thermostat then it makes sense to stick with gear from the same manufacturer.